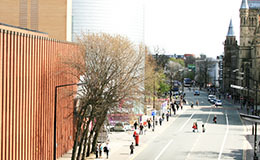 School of Computer Science, University of Manchester, Kilburn Building, Oxford Road, Manchester, M13 9PL, United Kingdom. City centre - the location of the university in Manchester (137 KB). Campus map - a detailed map of the whole campus together with an index of buildings Kilburn Build. No 39 on the campus map. You can find us on Google Earth by typing M13 9PL in the Google Earth search box. You will need a PDF Reader such as Adobe Acrobat to view these maps. There is an accessibility map for the University on the DisabledGo website. It includes access guides for each building.